Sākums Home EN Top menu Deiva Ltd.
“Deiva” ltd. offers to get products brought out from beekeeping products. We offer 100% beeswax candles of various forms and size as well for daily or special occasions or as wonderful present. We are not capable to change many things, but we can improve quality of Your life offering healthy products from nature! 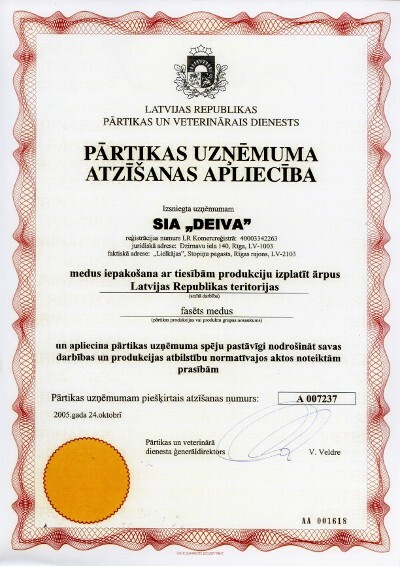 "Deiva"ltd. was founded in 1997. It preserves and continues to develop traditions connected with processing of beekeeping products and introducing market with new products. Raw materials of the production are used to be purchased from the beekeepers and farmers of Latvia. "Deiva"ltd. gives priority for production of local producers. In the course of time stable and trustworthy collaboration relations with them have been formed. We endeavour to purchase raw materiÄls from as various districts of Latvia as possible. In this way we support local producers and in the same time are able to offer our clients broader assortment of flavour and sort. Our company is proud of wide and varied assortment of production. We pay especially much attention to the quality of our products. to improve the system of quality control for bringing out the production of higher quality. Beekeeping products in honey - supplements: pollen in honey, propolis in honey, royal jelly in honey, bee portion (pollen, propolis, royal jelly in honey). We have started series of products like: aloe in honey, celery in honey, and golden root in honey. Novelty in our production – oranges in honey, kiwi in honey and lemon in honey. Copyright © 2010 - 2019 Medus produkti un inventārs Latvijā.